* Based on Hypothetical 5% Commission Plus HST, REBBA states all commissions are negotiable. Advertised Offers Not Available By All Registrants of Your Choice Realty Corp., Brokerage. Not Intended to Solicit Persons Under Contract to Another Brokerage. ** Staging Offer is for Consult and Existing Furniture Re-Arrangement plus Accents by 3rd Party Staging Company, additional furniture will be quoted by Stager Separately to Seller. 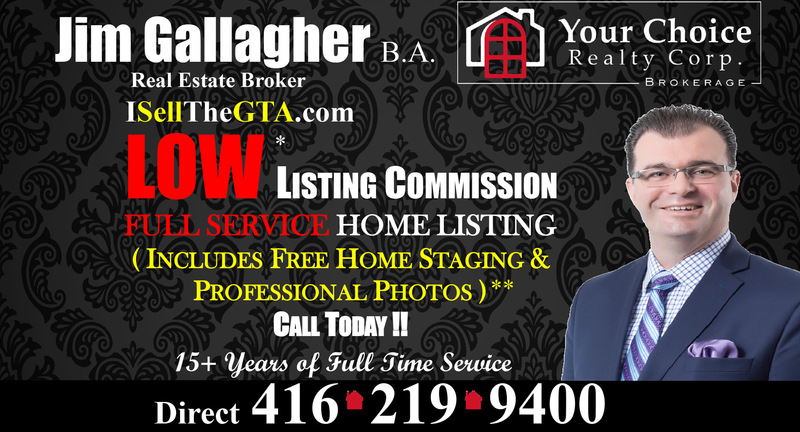 Brokerage is not affiliated with Stager and not in Staging Business and assumes no liability for staging activities, and property must be listed on MLS with Jim Gallagher as listing agent.